My selection is a combo of things that have been on my shopping list for a very long time AND some new Christmas sets. 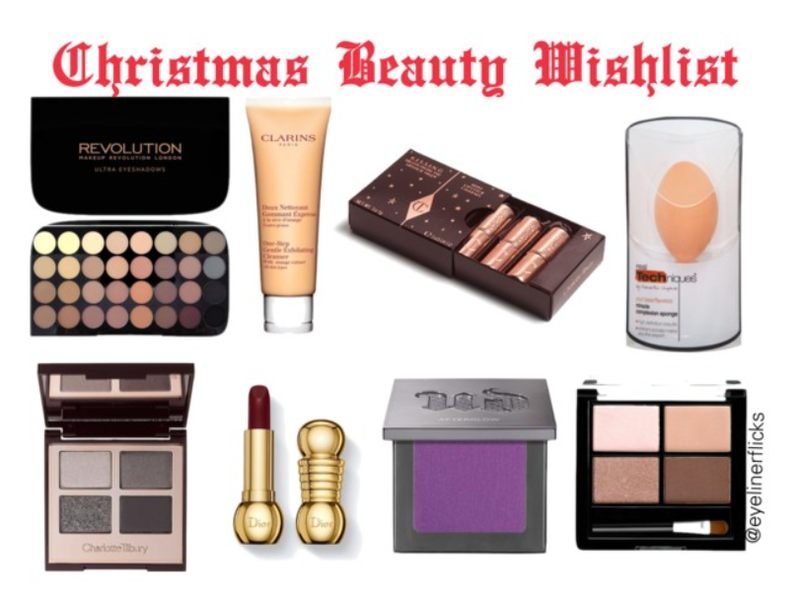 I've been trying to get into eyeshadow a bit more recently and this seems to be reflected in my wishlist. I've never been a fan of blogger/ beauty collabs but the shades in this little Fleur de Force quad look so wearable for work that I'd be tempted to give it a go. Same with the Make Up Revolution palette: since I'm feeling a little more adventurous lately I'd like to try some new shades without spending a fortune - Make Up Revolution seems like an obvious choice. The Charlotte Tilbury quad is one I have tested - a friend has it and the shades in this one are PERFECT for me for a night out. Usually if I go for eyeshadow I stick to black/ greys and the quality of this is just simply stunning, I think I'll have to pick this up very soon. Last week I treated myself to my first ever DIORific lipstick and I completely adore it. Problem with that is I think I may need more in my life. I've now been eyeing up the darker more vampy Troublante shade - I think it may be what Christmas dreams are made of. My brother bought me the CT quad in Vintage Vamp and I got myself The Sophisticate with money from my grandparents...I had to get The Sophisticate, because I'm hella sophisticated *shrugs* Once you try the RT sponge, you will never go back, just saying. Love the guide, lady!